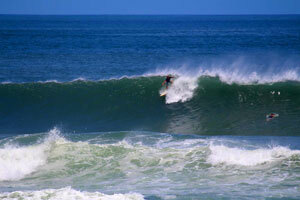 Learn how to surf and stay in one of our charming cabins overlooking the beach. Santa Catalina is the perfect spot to catch your first waves on a surfboard. 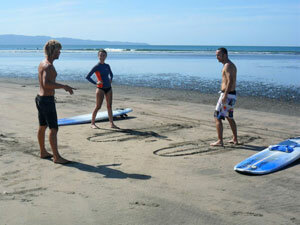 Book one of our surf camp offers or just take a lesson with our experienced surf teachers. If you already know how to surf, you can book a surfguiding to improve your skills, learn how to read the waves and find the perfect position in the wave. We have a good range of boards to rent: softtop beginner boards, short boards, longboards, fun boards and a Standup-Paddle-Board (SUP). Please fill out our reservations form to check for room availability. 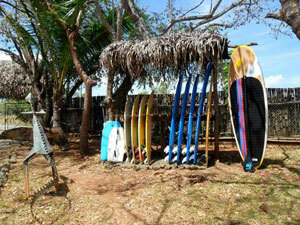 Once we get in touch - let us know about your interest in one of our surf camp packages!